The all-new Commander Mossy Oak Hunting Edition is outfitted with many key essentials for a day in the field. 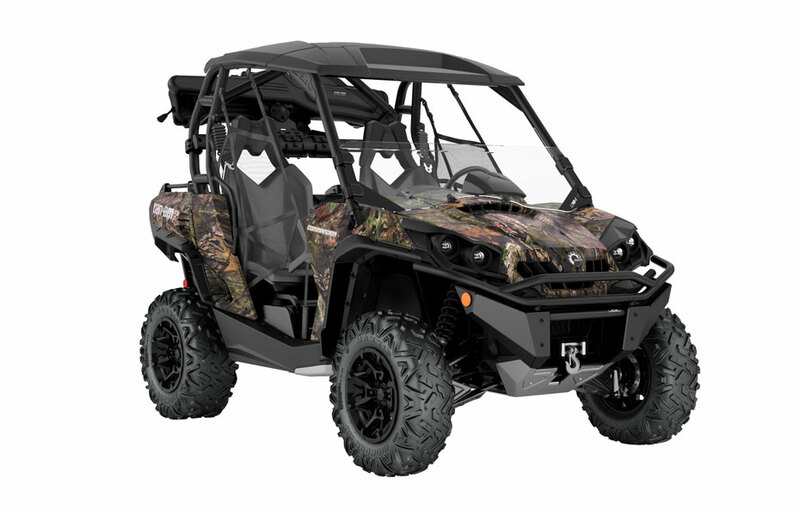 Purposely configured with hunters and outdoorsmen in mind, the Mossy Oak Hunting Edition, the direct result of joint effort from Can-Am and Mossy Oak, includes several of the standard XT package items (bed rails, mudguards, bumpers, wheels, tires and WARN winch), yet also gets a few unique features as well. The most noticeable of those is the new water-dipped Mossy Oak Break-Up Country Camo, but it also includes gun boots, winch, full skid plate, roof and much more. The 27-inch (68.6 cm) Maxxis Bighorn 2.0 tires offer dependable traction and sidewall stability in rugged terrain. They’re fitted to black, 14-inch (35.6 cm) cast aluminum wheels to complete the stealth look. 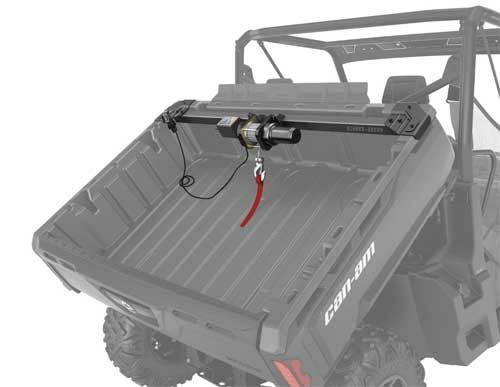 The package features a huge WARN 4,500-pound winch with roller fairlead and fully sealed motor. The rugged, dependable winch can haul out big game and get hunters out of a pickle if needed. Along with a more rugged appearance, the cargo box bed rails provide additional locations to attach tie-downs for cargo carrying. Two protective 6.0 Impact gun boots by Kolpin are attached to a rear cab-mounted gear rail with brackets. The gun boots include removable, shock absorbing foam and nylon impact liner for superior interior protection. The portable gun boots also feature a lockable hatchback design,snap-close cover and integrated handle. A durable, heavy-duty, two-piece plastic sport roof serves to protect the occupants from elements while giving the Mossy Oak vehicle a custom appearance. The package includes a fully functional half windshield for a stunning look and functional windbreak on cool days and to limit the amount of debris entering the cab. A lightweight, durable aluminum full-length skid plates ensures the underside of Commander Mossy Oak Hunting Edition 1000 is protected from destructive rocks, stumps and other hidden obstacles. When it comes to concealment, nothing compares to the exclusive Mossy Oak Break-Up Country Camo. The highly durable water-dipped camo finish is more resistant to scratching, mineral deposits and sun fading. More importantly, it lets hunters match their favorite camo manufacturer with their favorite side-by-side vehicle brand. The powerful-and-efficient liquid-cooled, 8-valve (4-valve / cyl.) 976cc SOHC Rotax 1000 V-Twin engine produces 85 horsepower for ample performance and torque for work and play. The progressive throttle ensures power is manageable no matter the terrain. The Commander features the industry’s first cargo box with two levels separated by a removable, watertight panel. It offers the possibility to have an upper and a lower bed with and independent, removable tailgate. The tilt-assist, dumping box has a 600-pound total capacity (400 pounds upper, 200 pounds lower). 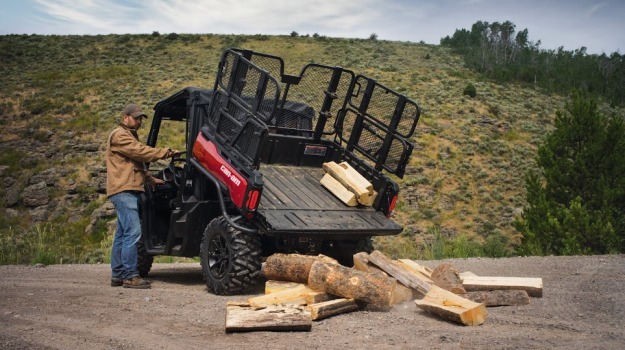 An impressive 1,500 pounds of towing capacity lets the Commander side-by-side vehicle family tow heavy loads. A standard 2-inch (50 mm) hitch receiver allows a standard vehicle towing bar and ball for added convenience. A large 10-gallon (37.8 L) fuel tank provides maximum range for work and recreation. BRP (TSX: DOO) is a global leader in the design, development, manufacturing, distribution and marketing of powersports vehicles and propulsion systems. Its portfolio includes Ski-Doo and Lynx snowmobiles, Sea-Doo watercraft, Can-Am all-terrain and side-by-side vehicles, Can-Am Spyder roadsters, Evinrude and Rotax marine propulsion systems as well as Rotax engines for karts, motorcycles and recreational aircraft. BRP supports its product lines with a dedicated parts, accessories and clothing business. With annual sales of over CA$3.5 billion from 107 countries, the Company employs approximately 7,600 people worldwide. Add even more versatility to the tough, capable and clever Can-Am Defender line of utility-recreation side-by-side vehicles by using genuine Can-Am accessories to make it your own.